This is so tragic. Teah Wimberly, a 16-year-old girl from Florida, has been found guilty of murdering another girl, Amanda Collette, who rejected her. Very sad. 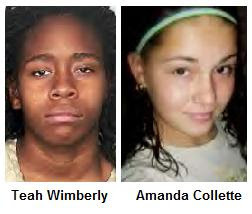 Teah Wimberly was convicted of killing Amanda Collette, 15, a classmate at a Miami high school. Wimberly had been sending Collete text messages declaring her love, and shot her after her advances were rebuffed, The Miami Herald reported Wednesday. After the on-campus November 2008 shooting, Wimberly called 911 and was arrested at a nearby restaurant. She confessed to police that she shot her friend "so she would feel pain too," the Herald said. Wimberly could be sentenced to life, but her lawyer is asking she be sent to a mental health facility. Lawyer Larry Davis argued Wimberly had suffered physical abuse from her parents and was tormented by her family's rejection of her for being gay, the newspaper said. "She's dealing with this like she deals with anything, putting her head down and moving forward," Davis said.